A wire carrying high-frequency currents is subject to the skin effect: most of the current flows near the outside of the wire. 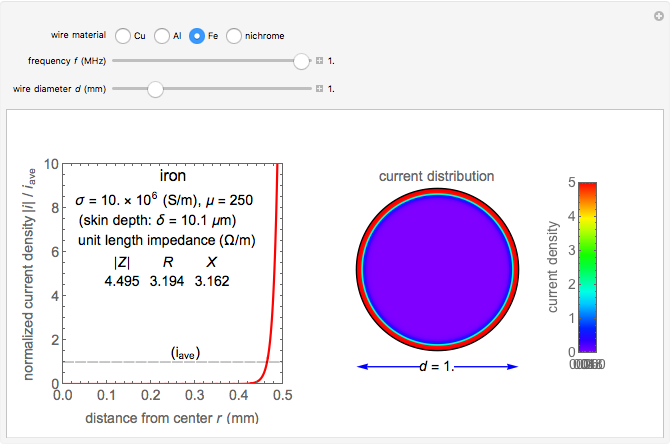 Assuming a sinusoidal current in a cylindrical straight wire of infinite length, the sectional current distribution is formulated using Bessel functions, which is determined by the wire's material properties, frequency, and diameter. The conductivity and permeability of the wire's material are relevant to the skin effect. The skin effects are characterized by the skin depth for a one-dimensional half-space model, which decreases for higher frequency ( ) and larger permeance ( ) or conductivity ( ). You can select the wire material from four choices, in which iron the shows smallest because of its large permeability. The current distribution is shown in the graphics both by curves and by colors. The impedance per unit length is shown in the inset. S. Takeyama, Theory of Electromagnetic Phenomena (in Japanese), Tokyo: Maruzen, 1944. The conductivities for the four materials are typical values at room temperature. The specific permeability is the typical initial permeability of pure iron. For the sinusoidal current of angular velocity flowing in the wire of radius , the current density at radius is given by , where . The output in the graphics is normalized to an average current density . The impedance per unit length is derived by dividing the outermost electric field by the current . The analysis associated with skin effect is a quasistatic field problem in which fields are governed by the diffusion equation (or in terms of current density, ). The above harmonic solution is obtained considering the cylindrically symmetric solution of this diffusion equation. 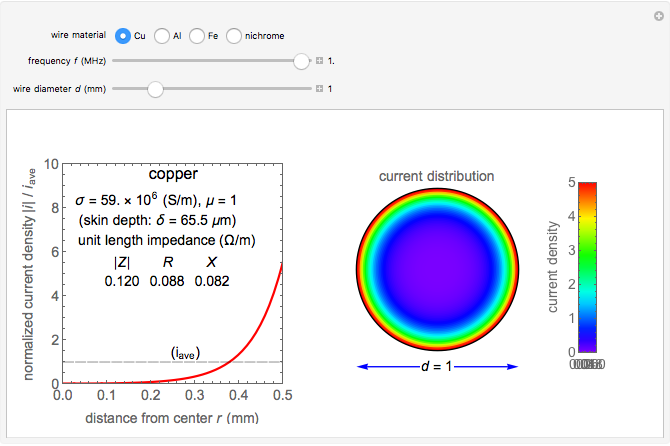 The diffusion equation corresponds to the Maxwell equation neglecting the displacement current. Y. Shibuya "Skin Effects in Straight Wires"